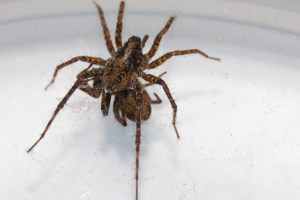 Observation - Wolf Spiders - UK and Ireland. Description: Caught in my bug traps, didn't realise they would fight so I put them in the same container, one killed the other one and started eating it. Caught in my bug traps, didn't realise they would fight so I put them in the same container, one killed the other one and started eating it.